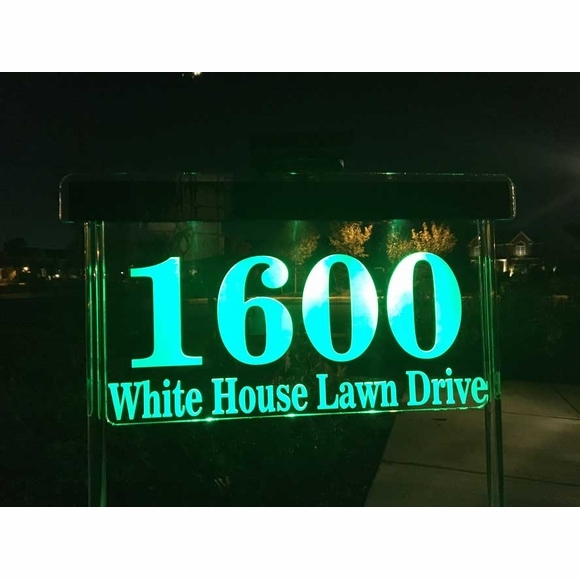 Solar Lighted Address Plaque Large - - 17.5" x 9.5" personalized solar illuminated address sign with lawn stake. Extra-large 4" high numbers. Lights the way for emergency responders, delivery drivers, service providers, and guests to find your home at night. The built-in amorphous solar panel charges even on mostly cloudy days and will glow for up to 12 hours. Turns on automatically during the night. Turns off and charges during the day. Dimensions: 17.5"W x 9.5"H x 3"D.
Illuminated address sign powered by free solar energy. No wiring required.